1) Open the App Store app on your device. 2) Scroll to the very bottom of the welcome screen. 3) Tap the “Redeem” button (circled in red in this iPad screenshot). 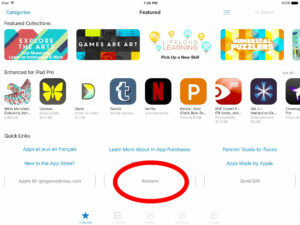 4) Enter the code manually and tap “Redeem” in the upper right corner of the pop-up window. 5) The app will download to your device. ← Make it free and they will come…or will they?